The Dow ended lower Thursday as manufacturing giant 3M shares slumped on the heels of disappointing quarterly earnings and guidance. However, advances in tech shares helped keep the Nasdaq in the green, and losses less pronounced in the S&P 500. The dollar rose to almost a two-year high against the euro on Thursday on an upbeat U.S. capital goods report, while world equities slid as weak economic data from South Korea and a profit warning from 3M Co renewed concerns about global growth. New orders for U.S.-made capital goods increased by the most in eight months in March, which combined with worries about the economic health of the euro zone knocked the single currency to its lowest against the greenback since May 2017. "The dollar is benefiting from strong domestic data, weak data abroad and a slew of dovish central bank meetings," said John Doyle, vice president of dealing and trading at Tempus Inc in Washington. Shares of 3M Co. ring up the biggest one-day decline in over 30 years, after the industrial, health-care and consumer products company missed profit and revenue expectations, slashed its full-year outlook, and said it was cutting 2,000 jobs. Disney looks set to break more box office records when its "Avengers: Endgame" Marvel superhero movie opens this weekend. Meanwhile, shares hit fresh highs on reports the company is in talks to take full ownership of Hulu. Ex-Vice President Joe Biden announced on Thursday that he is seeking the Democratic presidential nomination in 2020, and while, many hoping for a contender to hoping to unseat President Donald Trump may cheer, at least one Wall Street investor believes the development spells bad news for the stock market. Only about 1% of the 30 million or so people who contribute to their Fidelity retirement account have managed to save at least $1 million. The average 401(k) balance hovers around the $100,000 mark. So, it must be near impossible for regular folks to reach seven-figures heading into those golden years, right? The numbers suggest otherwise. 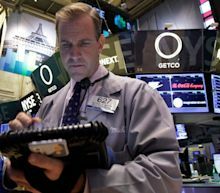 The Dow Jones Industrial Average tumbled but regained some lost territory after 3M missed earnings and revenue estimates. Other indexes mostly rose.